Call it a super Saturday as San Diego Section division championships were contested in cross-country, girls’ volleyball, girls’ field hockey and boys’ water polo. The cross-country championship meet took place at Morley Field. 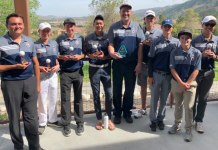 Besides determining which teams would walk off the course with coveted division titles, the meet—which involved all teams in the section—also determined which teams would continue the season with a trip to the state championship meet in Fresno. 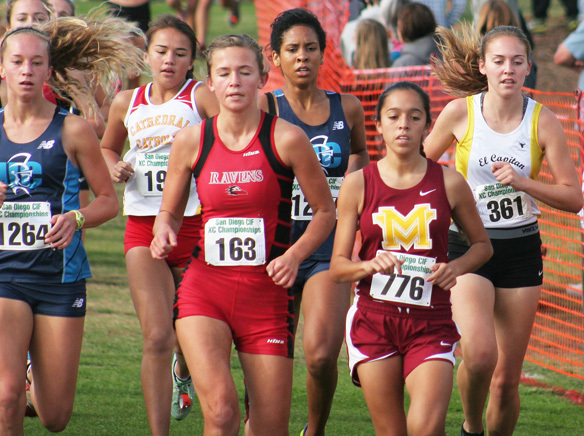 It was a magical day for the Monte Vista girls’ team, which cemented a fourth-place finish in the Division III field to earn a trip to Fresno’s famed Woodward Park. Fourteen runners from East County teams also earned a trip to Fresno this weekend as individual qualifiers. Senior Celina Lepe, who finished sixth among individuals to lead the reigning Grossmont Valley League champion Monarchs on the course, will be making her second trip to the state meet, but the first with her team. “It’s so much more comforting knowing that we’ll all be going to be there,” said Lepe, who timed 16:53 on the 2.75-mile course. The Monarchs placed all five of their scorers in the top 27 percent of the 128-deep field. Following Lepe across the finish line were senior teammates Arlette Sanchez (19th, 18:03), Katia Roldan (27th, 18:26), Deborah Saltzen (28th, 18:26) and Teresa Alday (32nd, 18:34). Junior Hayla McFeely (33rd, 18:36) and senior Alison Cao-Romero (70th, 20:19) rounded out the team’s seven runners in the race. Monte Vista finished with 112 points to place behind division champion Cathedral Catholic (41 points), runner-up Del Norte (95 points) and third place Canyon Crest Academy (104 points). The Monarchs out-pointed fifth place San Dieguito Academy (165 points) and sixth place University City (169 points) for the last state qualifying team berth in the division. Among the hefty haul of individual qualifiers from East County teams are a trio of runners each from Valhalla, El Capitan and Mountain Empire high schools. Seniors Shea Ricketts and Kristin Semancsin and junior Trent Rule will represent Valhalla while seniors Jorge Gomez and Reoh Darwell and junior Kayden Carpenter will represent El Capitan. Sophomores Makiah Salzano and Kyley Inman and senior Mason Smith will represent Mountain Empire. Two Steele Canyon harriers also earned individual berths to the state meet — juniors Josh Paradise and Sophia Alcaraz — while two Christian runners also advanced: junior Spencer Crouder and senior William Kiel. Monte Vista sophomore Tyler Lopez also qualified to run in Fresno. This is the fourth trip to the state meet for Ricketts, who previously went twice as an individual qualifier. Semancsin, who previously finished as this year’s Grossmont Hills League individual champion, timed 17:00 to finish 14th in the division finals. The top four teams in the division advanced to the state meet along with the top five individuals not on any of those qualifying teams. Valhalla finished fifth with 120 points — just 10 points behind fourth place Westview. Las Costa Canyon, with three runners among the top five individual finishers, easily wont eh team title with 40 points, followed by runner-up Poway (84 points) and third place Rancho Bernardo (103 points). Steele Canyon’s Alcaraz wrapped up the final individual qualifying spot in the 136-deep Division II girls race with her 16th-place finish in 17:06. In the 5K Division II boys race, Paradise finished eighth in 16:23 while Rule was 11th in 16:33. Monte Vista’s Lopez (fifth, 16:48) and El Cap’s Gomez (eighth, 16:56) and Darwell (ninth, 16:56) all posted top 10 finishes in the 130-deep Division III boys race while El Cap’s Carpenter finished seventh (17:05) in the Division III girls race. In the Division V girls race, Salzano (fourth, 18:09) and Inman (fifth, 18:35) led the Red Hawks while Smith finished fifth (17:41) in the Division V boys race ahead of Christian’s Crouder (ninth, 18:16) and Kiel (11th, 18:16). El Capitan’s boys squad finished fourth in the Division III team standings—just five points behind Del Norte, the final team qualifier in the division. Saturday’s section finals featured a combined field of 1,195 finishers—636 in the five divisional boys races and 559 in the five divisional girls races. The state championship meet is scheduled Saturday, Nov. 30. For updates, visit the website at www.sdtrackmag.com.